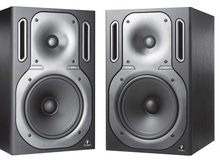 ATC announces the availability of the second version of its SCM20ASL Pro active monitors as well as the SCM20PSL Pro passive edition. Alesis adds to its Elevate near field monitor series two new 6” versions, one being active and the other passive. JBL Pro was at NAMM to introduce the 2-way M2 passive studio reference monitors designed for mastering. Dynaudio introduces its 20th Anniversary M3XE monitors. Pelonis has released its Sound Model 42 models. The Compact series comprises the 8" two-way TCX-8, 10" two-way TCX-10, 12" two-way TCX-12, and 15" two-way TCX-15 passive loudspeakers, plus TCX-15B and TCX-18B subwoofers, all with Speakon NL4 and barrier strip connectors. KK labs, a new loudspeaker manufacturing company established by the founder of KRK Systems Inc., and a former Apogee Sound V, will make its official public debut at Musikmesse Frankfurt (Hall 8.0, E26). KRK Systems announces they are now shipping the R6 passive studio monitor.